If you’re looking for a company that cares, look no further than Johnson & Johnson. It might be an enormous corporation, but that doesn’t mean it doesn’t have a soul. Johnson & Johnson just proved that it’s completely committed to customers by releasing an 8,000-calorie shampoo that people can eat if they get trapped in the shower. Amazing! It’s incredible to see a company that’s so committed to the safety and well-being of its customers! According to Johnson & Johnson executives, the new 8,000-calorie Aquafeast shampoo will offer all of the same fortifying and moisturizing properties of traditional shampoo, but it will also contain high concentrations of carbohydrates, fat, and vitamins so that people can squirt it into their mouths to survive when they find themselves unable to leave the shower for days at a time. It looks like this is a company that is not prepared to let its customers starve to death in the shower. If people become trapped under an avalanche of lotion bottles or their hands become too slippery to pull back the shower curtain, all they need to do is reach for a bottle of Aquafeast to feed themselves during the long days and nights that they spend imprisoned in the shower. Customers will be able to survive for days, and when they’re finally rescued from the shower, they’ll be healthier than ever! This is a company that knows how to treat its customers! Johnson & Johnson even included a mixture of coconut oil and vinegar to dull the bitter taste of the 18 natural extracts that leaves hair silky and tangle-free. While the taste of soap is still overpowering, Johnson & Johnson claims that the taste of vinegar and coconut is still unmistakable, so if you get trapped in the shower, you’ll be able to enjoy the great flavors of Johnson & Johnson’s survival shampoo until a rescue team arrives. Incredible. 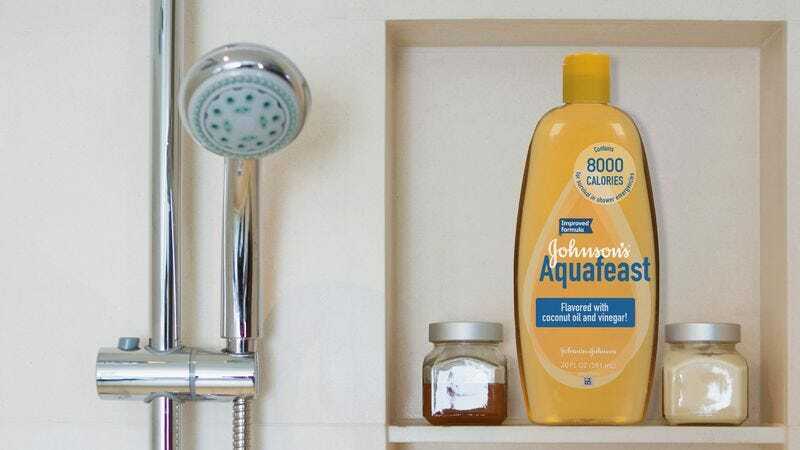 Showering just became a whole lot safer, and it’s all thanks to Johnson & Johnson and its new highly caloric shampoo. Here’s hoping more companies start showing the same commitment to customer safety that Johnson & Johnson does!